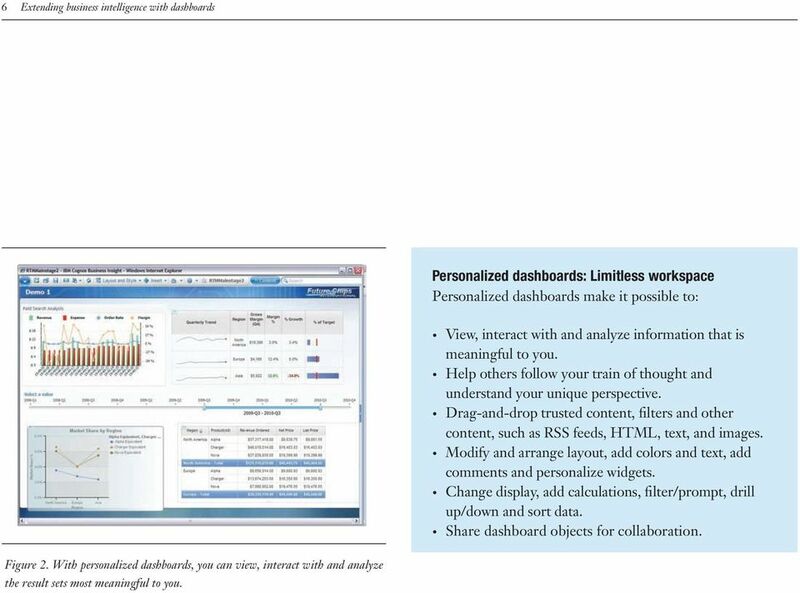 Download "Extending business intelligence with dashboards"
6 6 Extending business intelligence with dashboards Personalized dashboards: Limitless workspace Personalized dashboards make it possible to: View, interact with and analyze information that is meaningful to you. Help others follow your train of thought and understand your unique perspective. Drag-and-drop trusted content, filters and other content, such as RSS feeds, HTML, text, and images. Modify and arrange layout, add colors and text, add comments and personalize widgets. Change display, add calculations, filter/prompt, drill up/down and sort data. Share dashboard objects for collaboration. Figure 2. With personalized dashboards, you can view, interact with and analyze the result sets most meaningful to you. 7 Business Analytics Software 7 The principles of the new generation of dashboards The following principles serve as an effective guide for understanding why a new generation of dashboards can help your organization manage performance better and create new opportunities for business optimization: The new generation of dashboards recognizes that dashboards mean different things to different people. There is no one size fits all and no single definition that applies across the board. The new generation of dashboards accommodates different comfort levels with technologies and individual roles. Close alignment between the user s role and the user interface enables productivity and acceptance. The new generation of dashboards helps users turn insight into action. A dashboard should provide all types of users with information they can use to move from insight to action quickly. It should enable an approach to exploring issues that can also predict potential outcomes and allow a course change (if necessary) before future issues arise. 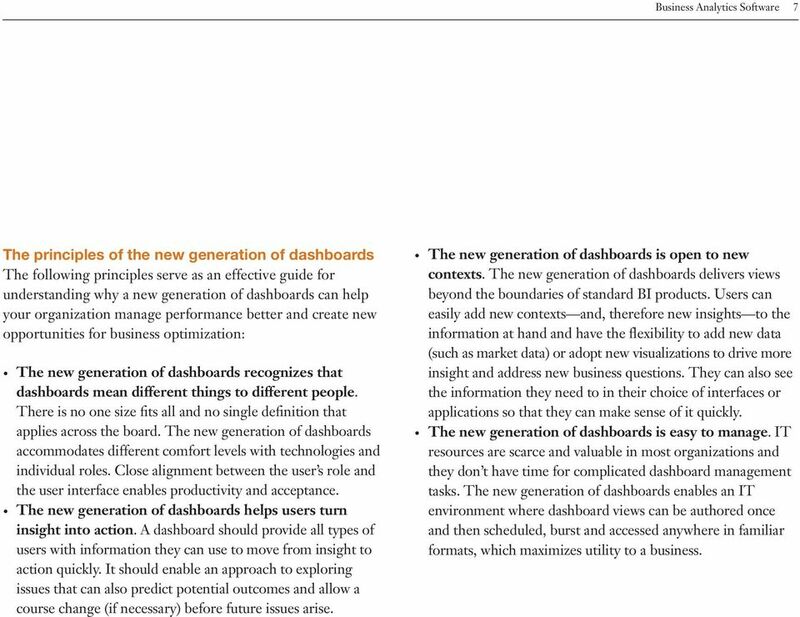 The new generation of dashboards is open to new contexts. 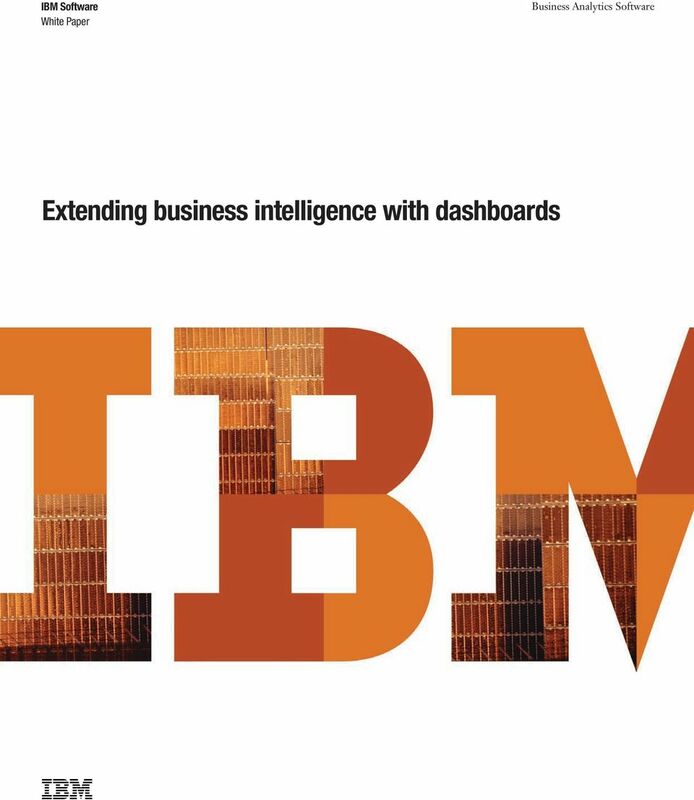 The new generation of dashboards delivers views beyond the boundaries of standard BI products. Users can easily add new contexts and, therefore new insights to the information at hand and have the flexibility to add new data (such as market data) or adopt new visualizations to drive more insight and address new business questions. They can also see the information they need to in their choice of interfaces or applications so that they can make sense of it quickly. The new generation of dashboards is easy to manage. IT resources are scarce and valuable in most organizations and they don t have time for complicated dashboard management tasks. The new generation of dashboards enables an IT environment where dashboard views can be authored once and then scheduled, burst and accessed anywhere in familiar formats, which maximizes utility to a business. 8 8 Extending business intelligence with dashboards The characteristics of the new generation of dashboards The new generation of dashboards provides the right level of information in a format that makes sense to users and can be accessed any time they need it. They should not have to be connected to your BI infrastructure or a web browser or be using a specific application. This is because business users don t have days to spare to come to a decision. They must make the call almost as soon as an issue becomes apparent. 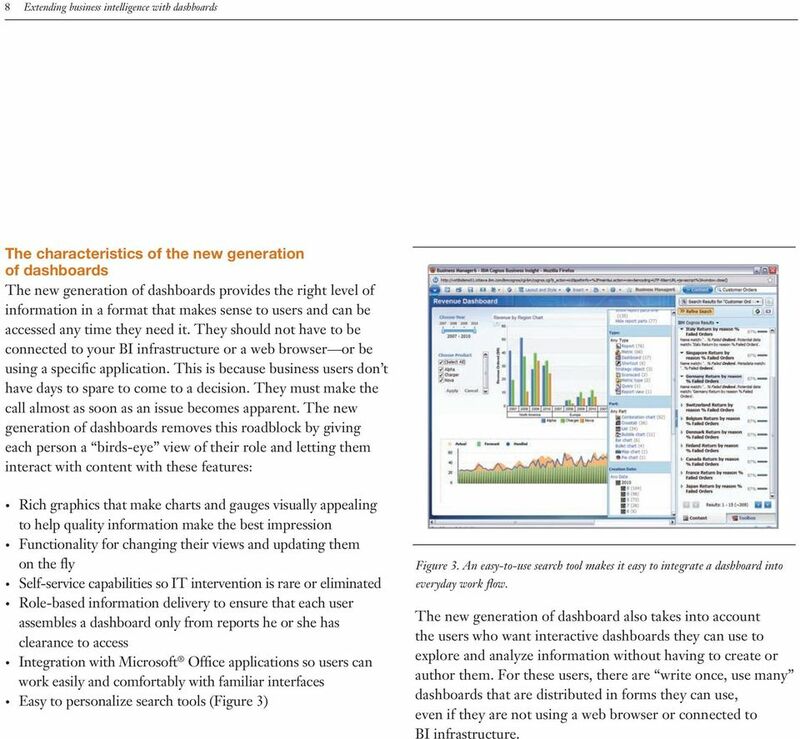 The new generation of dashboards removes this roadblock by giving each person a birds-eye view of their role and letting them interact with content with these features: Rich graphics that make charts and gauges visually appealing to help quality information make the best impression Functionality for changing their views and updating them on the fly Self-service capabilities so IT intervention is rare or eliminated Role-based information delivery to ensure that each user assembles a dashboard only from reports he or she has clearance to access Integration with Microsoft Office applications so users can work easily and comfortably with familiar interfaces Easy to personalize search tools (Figure 3) Figure 3. An easy-to-use search tool makes it easy to integrate a dashboard into everyday work flow. The new generation of dashboard also takes into account the users who want interactive dashboards they can use to explore and analyze information without having to create or author them. 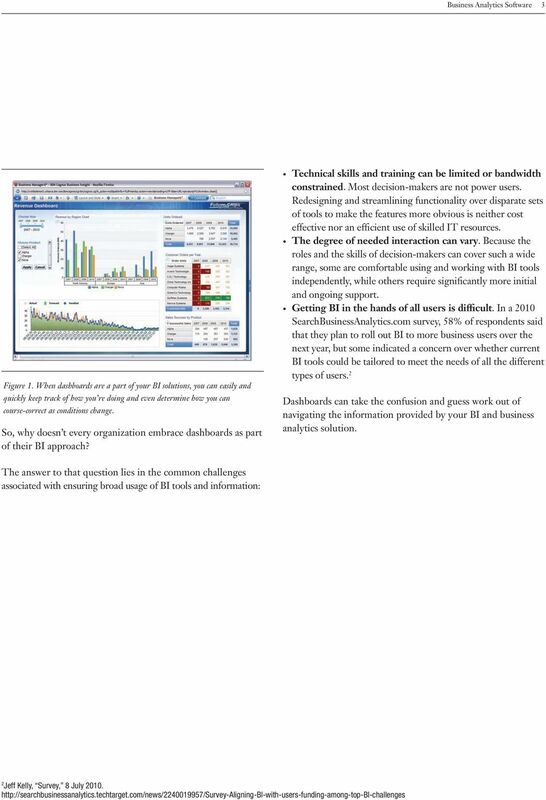 For these users, there are write once, use many dashboards that are distributed in forms they can use, even if they are not using a web browser or connected to BI infrastructure. 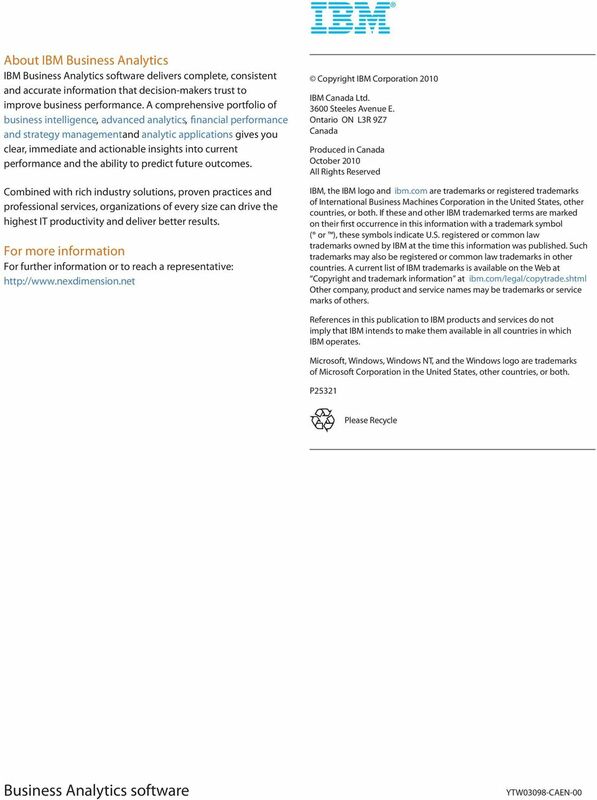 11 Business Analytics Software 11 IBM provides dashboard capabilities that allow any user to access, interact and personalize content in a way that supports the way they make decisions. Users can quickly move from insight to action. They also benefit from the power of their dashboard content with information they can trust, from their perspective, in their desired format. 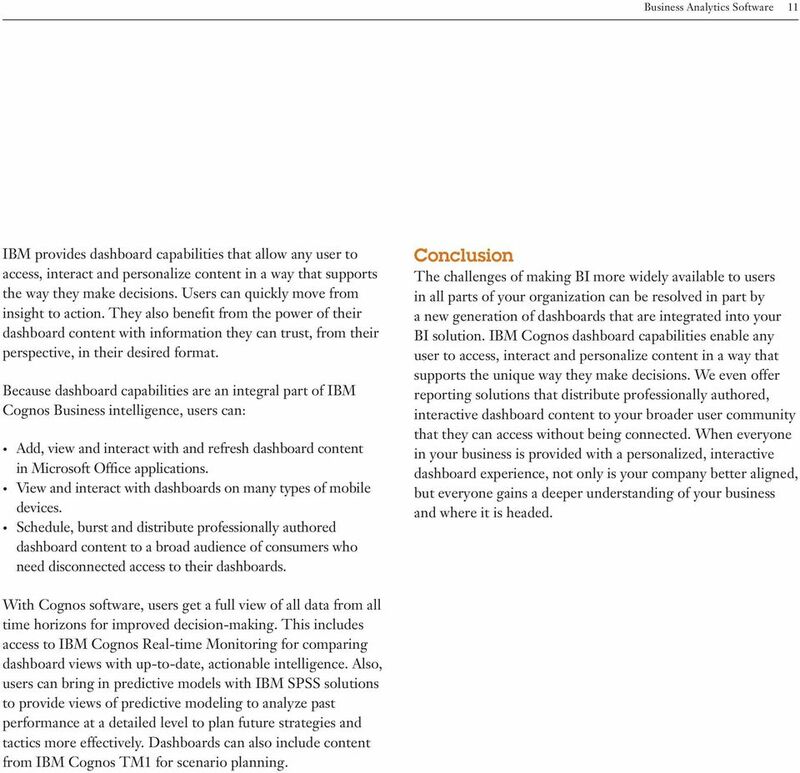 Because dashboard capabilities are an integral part of IBM Cognos Business intelligence, users can: Add, view and interact with and refresh dashboard content in Microsoft Office applications. 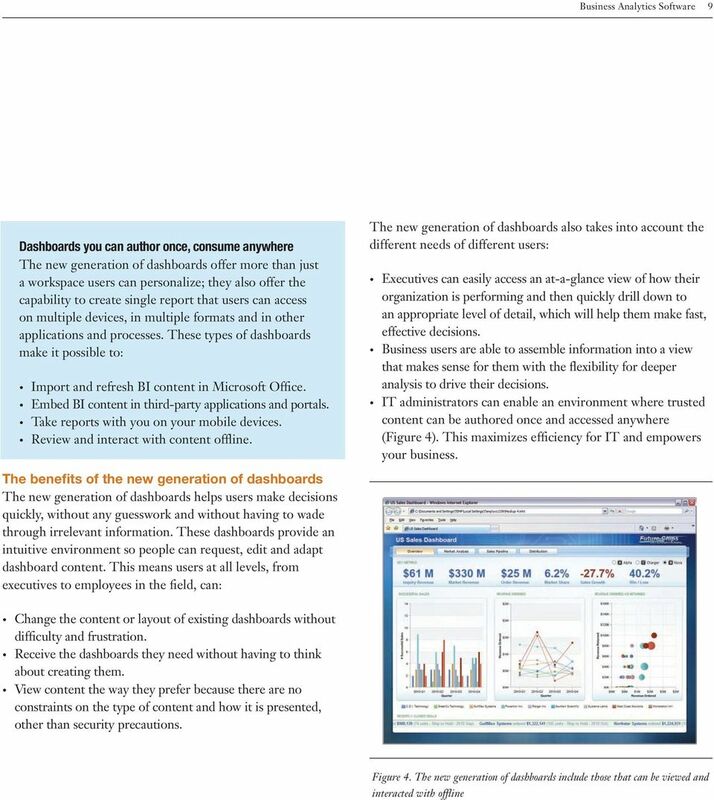 View and interact with dashboards on many types of mobile devices. Schedule, burst and distribute professionally authored dashboard content to a broad audience of consumers who need disconnected access to their dashboards. 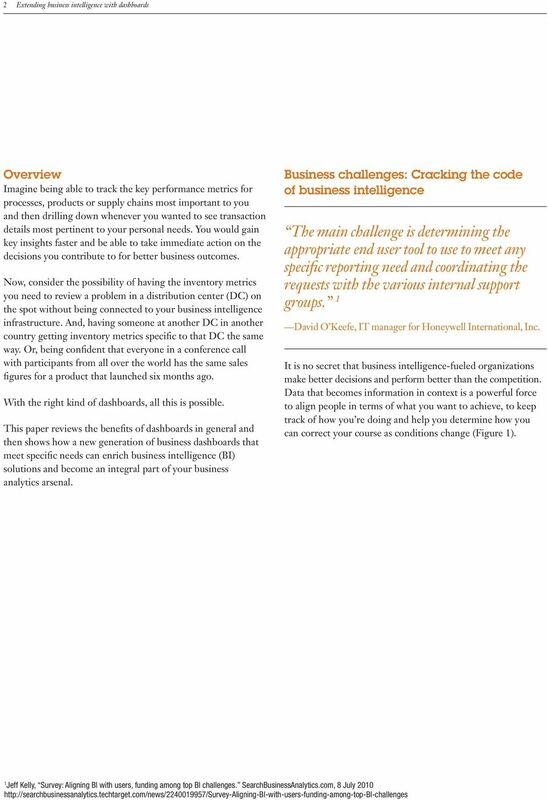 Conclusion The challenges of making BI more widely available to users in all parts of your organization can be resolved in part by a new generation of dashboards that are integrated into your BI solution. 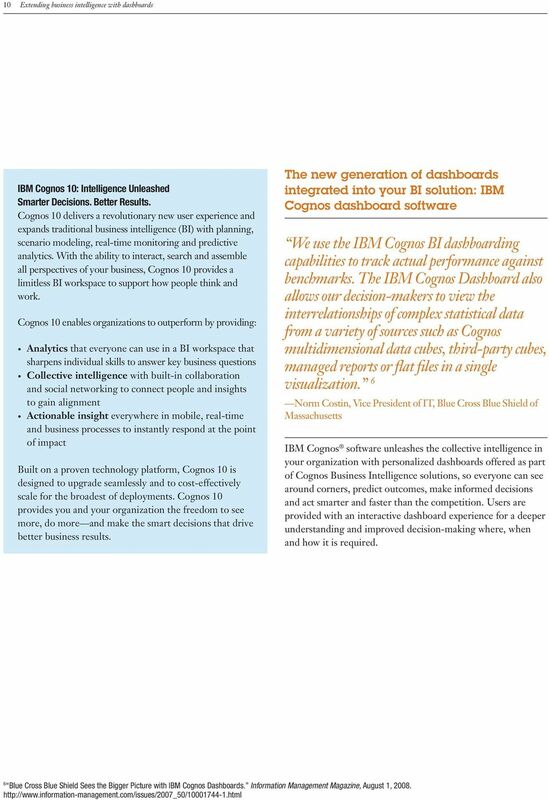 IBM Cognos dashboard capabilities enable any user to access, interact and personalize content in a way that supports the unique way they make decisions. We even offer reporting solutions that distribute professionally authored, interactive dashboard content to your broader user community that they can access without being connected. When everyone in your business is provided with a personalized, interactive dashboard experience, not only is your company better aligned, but everyone gains a deeper understanding of your business and where it is headed. With Cognos software, users get a full view of all data from all time horizons for improved decision-making. This includes access to IBM Cognos Real-time Monitoring for comparing dashboard views with up-to-date, actionable intelligence. Also, users can bring in predictive models with IBM SPSS solutions to provide views of predictive modeling to analyze past performance at a detailed level to plan future strategies and tactics more effectively. Dashboards can also include content from IBM Cognos TM1 for scenario planning.